It was Friday night in the Emergency Room at Hadassah Hospital Ein Kerem. Nurse Ola Ostrovsky-Zak began her shift as usual, but by the time it ended, she had added an unusual element to her nursing care. A head-on collision with a bus brought nine-month-old Yaaman Abu-Ramila by ambulance to the ER. His mother was critically injured; his father had been killed. Sedated and intubated, Yaaman’s mother was placed in Hadassah’s intensive care unit. Little Yaaman was sent to the pediatric ER. Although Yaaman had a skull fracture and lung injury, the biggest problem was that he refused to take a bottle, and his mother wasn’t able to nurse him. For seven hours he refused to eat at all and was deteriorating. He wouldn’t stop crying. His aunts asked me if I could find a wet nurse for the baby, relates Nurse Ostrovsky-Zak. I didn’t think twice. I had an easy solution. I could nurse him myself. I’m here all night anyhow. Nurse Ostrovsky-Zak, an enthusiastic supporter of breastfeeding, has three children of her own. I fed him five times during the night, she recalls. Originally a professional dancer, Nurse Ostrovsky-Zak became interested in nursing after giving birth. Thanks to the midwives who took care of her, she felt empowered and was so impressed with them that she changed careers and became a midwife. How did the baby feel to have a stranger breastfeed him? I watched him settle comfortably in my arms, says Nurse Ostrovsky-Zak. He shut his eyes peacefully and fell asleep. It felt natural. Yaaman’s aunts hugged her and thanked her, Nurse Ostrovsky-Zak remembers. They were surprised because they said they didn’t know that a Jewish woman would agree to breastfeed a Palestinian baby. I told them that any breastfeeding mother would agree. Is there a mother in Jerusalem, she asked, who is close to Hadassah Hospital Ein Kerem who can feed a baby tomorrow morning? In a short time, women from all over the country responded, volunteering to help. Some were even willing to come all the way from Haifa. Others who didn’t have milk offered to come to hold the baby. At Hadassah, we treat everyone. I say that without a drop of cynicism. In the trauma center, we sometimes have the terror victim in one bed and the terrorist in another. We treat whoever needs treatment, urgency first, without thinking about ethnic background. 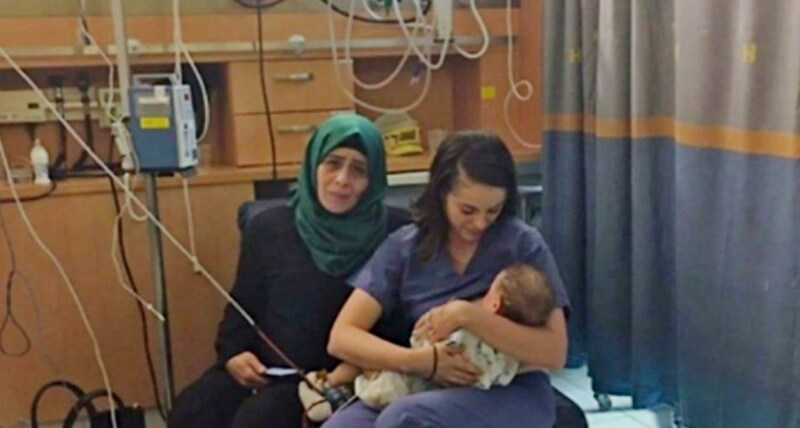 By chance this baby that needed nursing was Palestinian. He had undergone a really difficult trauma, and it felt no different from nursing one of my own children. The baby’s family is still emotional about the loving care that was given to him in the hospital. The nurse is like a sister in our family, noted Aunt Samar. She came to Yaaman’s rescue and gave him loving care. We can’t thank her enough from the bottom of our hearts. She saw a baby, not his nationality. According to Islam, Yaaman’s grandmother adds, if a woman nurses a baby five times, the baby is considered her son. That fulfills a dream of mine, said Nurse Ostrovsky-Zak. I’ve wanted to have a fourth child. Watch an interview with Nurse Ostroivsky-Zaktelling her story below.